Wired Equivalent Privacy (WEP) is a security protocol designed for Wireless Local Area Networks (WLAN). It can either be a 64-bit key with 10 hexadecimal digits or a 128-bit WEP key with 26 hexadecimal digits. This encryption will prevent other users from connecting to your Wi-Fi and protect your wireless transmissions / communications from being accessed or received by other users. Access the wireless access point’s web-based setup page. For instructions, click here. QUICK TIP: If you are using a Mac® computer, click here. 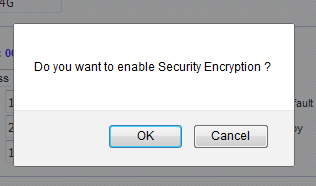 In the Wireless Security section, select Enable. Then, click the Edit Security Settings button. NOTE: Image may vary depending on your access point's version or model number. 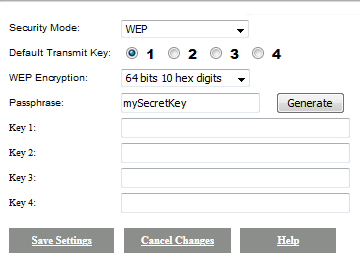 A pop-up window will appear, click OK.
On the Security Mode, select WEP and select your access point's Default Transmit Key. In this example, 1 is selected. 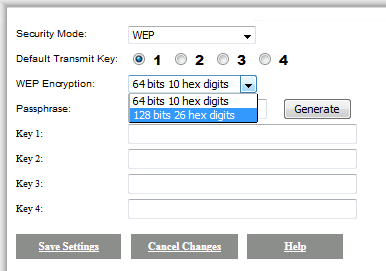 Under the WEP Encryption, click the drop-down menu and select 128 bits 26 hex digits. If you want the access point to generate a password, look for the Passphrase field and type a unique word. Then, click the Generate button. In this example, mySecretKey is used. This will generate or display a string of random characters in Key 1. Copy Key 1 correctly since it was selected as the Default Transmit Key. You have now set up a 128-bit WEP wireless security on your Linksys access point.